One might believe that the only way to create a scrumptious and mouth – watering steak is to cook steak with the use of a grill. That, however, is a common misconception. I can inform you of a relatively easy way to cook a steak using just your stove. The first step is to head to a store, more particularly its meat counter. To be able to obtain that perfect steak, one has to have an understanding of the different beef grades. The grade of a beef is what tells you its meat quality, on the basis of age and marbling. To virtually ascertain a steak’s marbling, take a look and focus on the meat’s texture. A cut that has little or no marbling at all is a cut that is fat free. Although the cut is definitely leaner and tenderer, it will not be as flavourful. The second portion to focus on the meat is its cut. Steak cuts can be classified in three sections. Starting from the upper portion of the back and then move down the middle of the back, there is the rib, then short loin and sirloin. The rib consists of cuts like back ribs, rib roast and rib – eye. This section is considered as tough compared to the other three sections. The next section is called short loin. This produces the Porterhouse, Top Loin, T-bone and Tenderloin. The sirloin consists of the top and sirloin steaks. Other steaks such as the round, flank, and chuck steak originate from their respective areas. These are usually tough cuts. 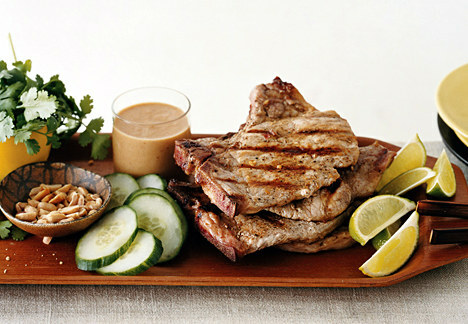 Strip steaks, similar to that of the New York Steak, are a result of the portion called the T-bone. After determining the type of meat you want to buy, now is the time to get the cooking starting. Have a pan that is big enough to accommodate your steak. Drizzle it with olive oil. Warm it up a bit but not too hot otherwise, the meat will burn on the outside and remains uncooked in the inside. The temperature to be achieved is one that is set at medium. Now that the pan is warm enough, carefully lay down the steak. Season your steak on one side. How you prefer to eat your steak determines the amount of time you will have to observe before you flip your steak over. Medium rare steak usually takes around ten to twelve minutes. You can also wait for around fifteen minutes before turning the steak over if you prefer your steak to be more done. After turning the steak over, season the other side. Cook the steak. When it is done, take the steak out of the pan. The heat must now be turned off. The pan must be moved away from the burner. Plate your steak. Steak is great with mashed or baked potatoes. It’s your call. Remember the Heinz 57 or A1 sauce as these make steak more flavourful.